Natural source, beet-derived betaine hydrochloric acid, also known as hydrochloric acid (HCL) or stomach acid. It helps digest food by breaking up fats and proteins, assists the body’s natural stomach acids in the absorption of nutrients, especially protein, calcium, magnesium, phosphorus, iron and B12. Healthy stomach acid is needed for a healthy digestive tract. If you have low stomach acid, even the best food cannot be properly digested. If you are unable to absorb nutrients properly, this can lead to a range of health problems. As we age, we typically produce less hydrochloric acid (HCL) which reduces our ability to efficiently absorb nutrients from food. Reduced HCL production affects the amount of protein and calcium we call absorb and can interfere with bone metabolism. Incomplete protein metabolism can imbalance intestinal flora. 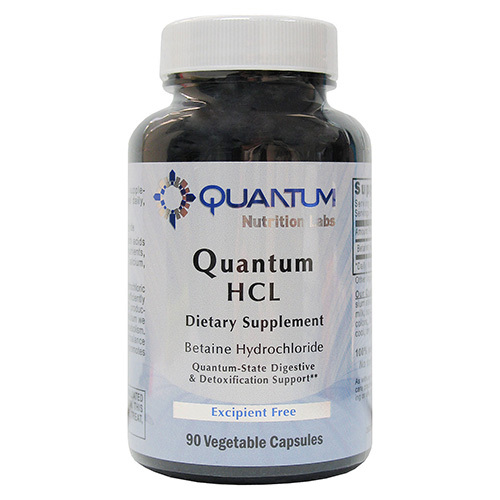 Betaine hydrochloric acid helps insure proper absorption of nutrients. We like Quantum products as they don't use excipients, and have very strict quality control. These HCL caps are free from pepsin - some people are unable to tolerate pepsin supplements. If you need to have pepsin as well as HCL, Radiance and Solgar HCL include pepsin and are available in most health shops. Or you may also wish to take Quantum Digest (see below) which contains pepsin as well as a plant based enzyme blend.